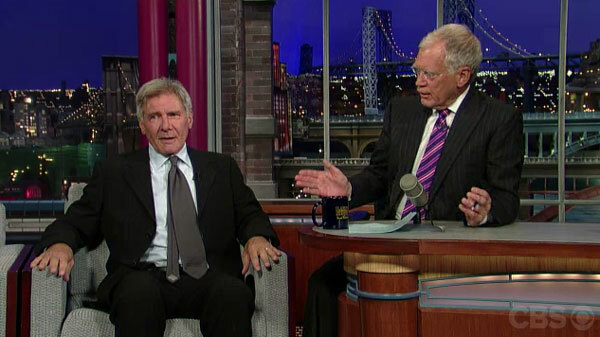 Harrison Ford gave one of the strangest late-night interviews of 2010 with his spaced-out appearance on “Conan,” and now he’s taken the lead in 2011 with last night’s trip to Letterman’s couch. As the Cajun Boy noted at Uproxx, Ford is rumored to be one of the biggest stoners in Hollywood, and last night’s interview will do absolutely nothing to dispel that. Even after the oddity of the Conan appearance, it’s still jarring to see Han Solo/Indiana Jones/Jack Ryan on TV talking like James Franco. The 15-minute interview is embedded below, and I watched the entire thing even though I have the attention span of a fruit fly. There’s so much to love: the spacey look on Ford’s face as he walks onstage, a surprisingly excellent series of Elizabeth Taylor jokes, Ford disparaging the Grand Canyon, his rambling introduction to the Cowboys & Aliens clip, and horseback riding. Yes, horseback riding (it’s what they called acting with Liz Taylor back in the day).